Ridiculous, as it may sound to many aspiring Mountaineers, I was just trying to overpower my sense of being here with a future self. I was just unable to live in the moment. My fears were personified in form of climbing & bouldering rocks after rocks. The training is about discipline & it knocks you out when you just thought your “Self Imposed discipline” was enough! Here discipline did not come easy, because my physical strength was in question. Mentally I thought, I am quite disciplined! Basic warm ups lead to rigorous training at Tekla, with carrying a weight of 15 kgs in your rucksack for a distance of 9 Kms every day. Following the same route for the next 6 days was EXHAAUSTING!. But with days passing by, the weight on our backs felt like our own weight while the distance on foot, still felt longer each day! Tekla is the official site for Rock craft assigned to N.I.M & here boulders would be marked depending on their difficulty levels. Climbing a rock isn’t as difficult as the climb of the heart, overpowering of thoughts & taking control of one’s body. 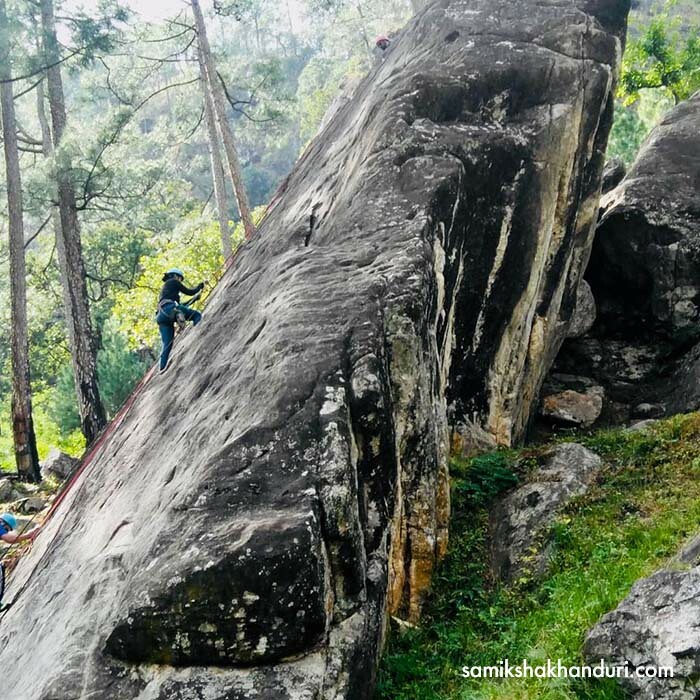 One boulder to another – slipping, gripping & harnessing our strength to convince ourselves of the mountain within, would be the task of the day. But not all people are mountains, some are mountains in their approach, some in their might & some have the sole aim of embracing the mountain. 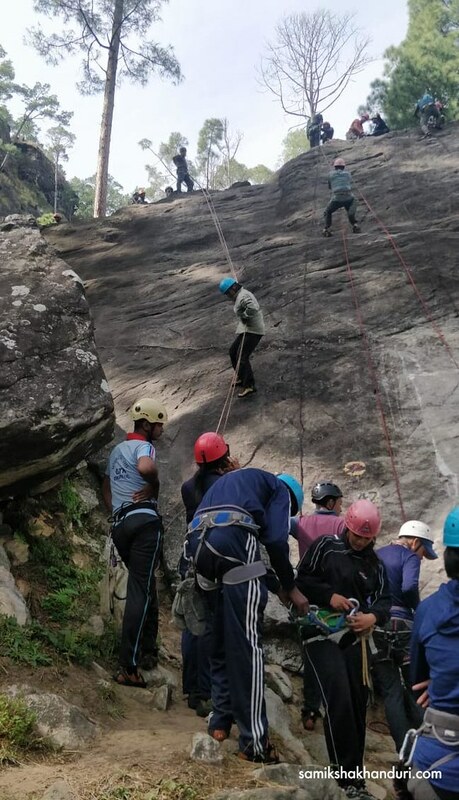 These 6 days we were taught about rock & a rope, the anchors & using one’s muscle strength to conquer a mountain. Rock craft covers rock climbing, bouldering, rappelling with the use of anchors & descenders. And when the Rock 43 turned to 44, we realised we were not only close to the end of one session, but the beginning of another – Ice & Snow Craft. The 6th day, turned into a nightmare, as we were now supposed to pack our rucksacks fully loaded to embark on a journey of 20 days into the Glacier. The journey began with a drive till Sukhi village, which is the starting point of the first leg of our trek to Tel Camp (Base Camp – 1). The Assi Ganga valley & its inhabitants are indeed stronger than might, for their wilful disposition & a headstrong heart. Few of our batch mates hailed from this region & it was leaving me awestruck to see how at ease they manoeuvred their feet, with a weight as heavy as wheels to reach the camp at Tel @ 8,300 ft. 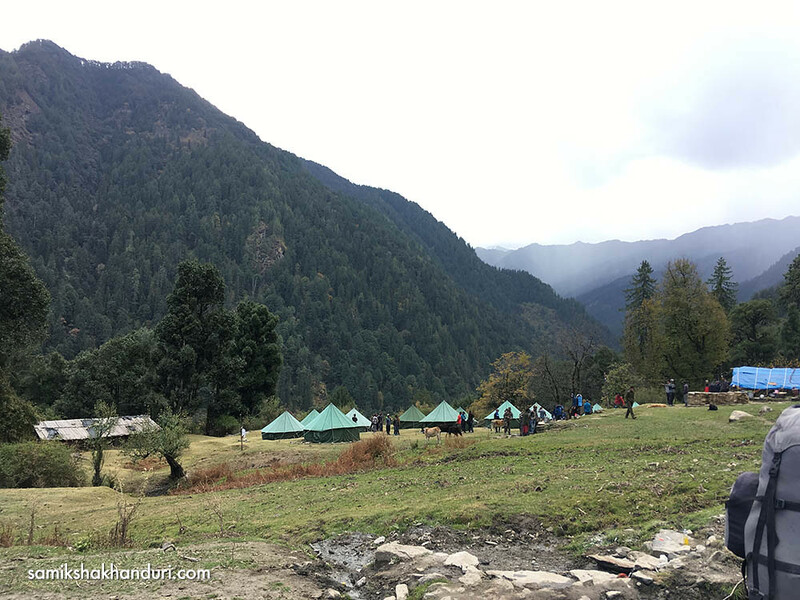 The Tel campsite is perched in the middle of a valley with high mountain views embracing on all sides. Lush greenery & a mind full of fresh Himalayan air, was enough to kick-start our journey on foot. We went for an evening acclimatisation hike to absorb the splendid views & to firm our foothold, Literally! Sliding on our way downhill we returned to the campsite to spend the night in a tent with 8 homies, jittering at the thought of the following day. The morning woke us up to open air washrooms, breakfast on the grass & a few reluctant faces. We were 120 students in all. Now, destined to the longest journey on foot that we probably had ever been on or imagined of. 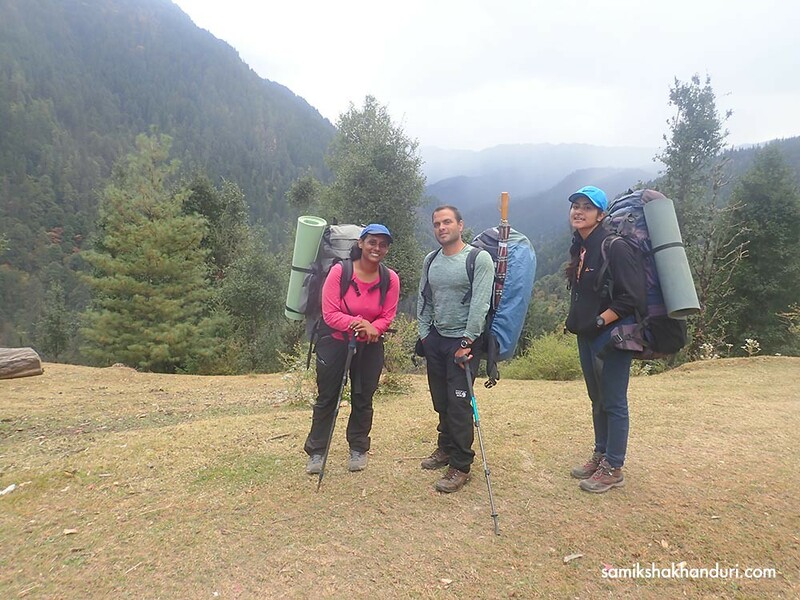 Trek to Gujjar Hut, (Base Camp – 2) @12, 800 ft. This trek was on a challenging terrain, full of narrow uphill trails, freshwater streams & wooden bridges to give you the thrill of a complete adventure. 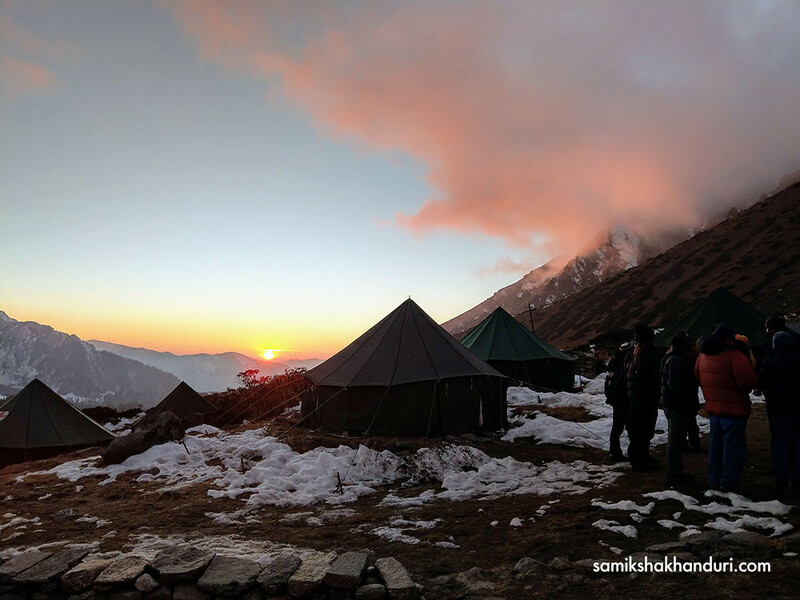 Half way through, the journey got arduous enough that our instructors had to fuel us with false hopes of being “Almost there.” Trekkers, reading this would relate to that feeling! We kept hiking in the hope of being able to catch even a distant glimpse of the Base Camp. But to our dismay we still had 3 more Kms to cover & the journey was purely uphill. Exhausted as we were the last leg of this trek was to pass through a wooden log over a hustling river & we were still a Km away from the campsite! I had almost made pictures of the campsite in my head by now. Things you do to keep your head occupied! By the time the last batch checked in it was already 5.30 pm & the sunset was in its full glory to receive us at this breath-taking location! It was nowhere close to anything I had seen before! While body had almost shut down by now, the happy faces of batch mates greeting us there served as a fuel. At a reasonable distance we could see the Dokrani Bamak glacier, looking straight into our eyes recharging our spirits with the last rays of sun. We did trek for 10 hours straight! All we could do now was squeeze into our tent, but it was soon time for soup & dinner. Holding your mess tins in that fierce – cold – wilderness – of -the – night was a task indeed. Eating in wilderness no longer seemed a matter of nutrition, but a test of endurance. It was an alarming temperature for the bare hands & to top it all, the pain of washing your utensils with cold water & head torch on was excruciating. Barely seeing the leftovers on the utensils, until the next morning! This night brought no sense to the head, as fatigue had formed a cloud overhead, spelling a night of sound sleep. DEAD! 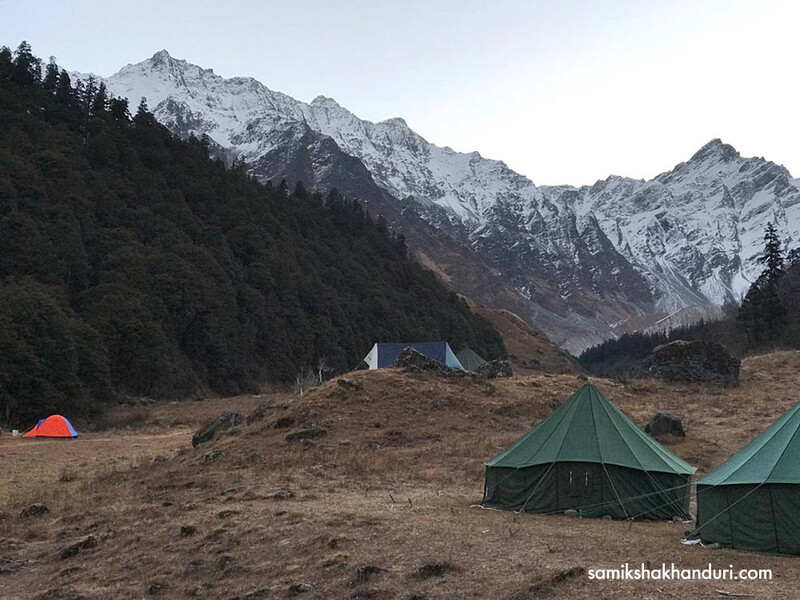 The next morning woke us up, not with the tiny particles of sunrays entering your tents (lighting up our faces) but with two shrieking whistle blows, to dispel our slumber. Solemnly we all rose to attend to nature’s call & layered ourselves up for breakfast, followed by a round of Ferry loading till our Base Camp – 3. 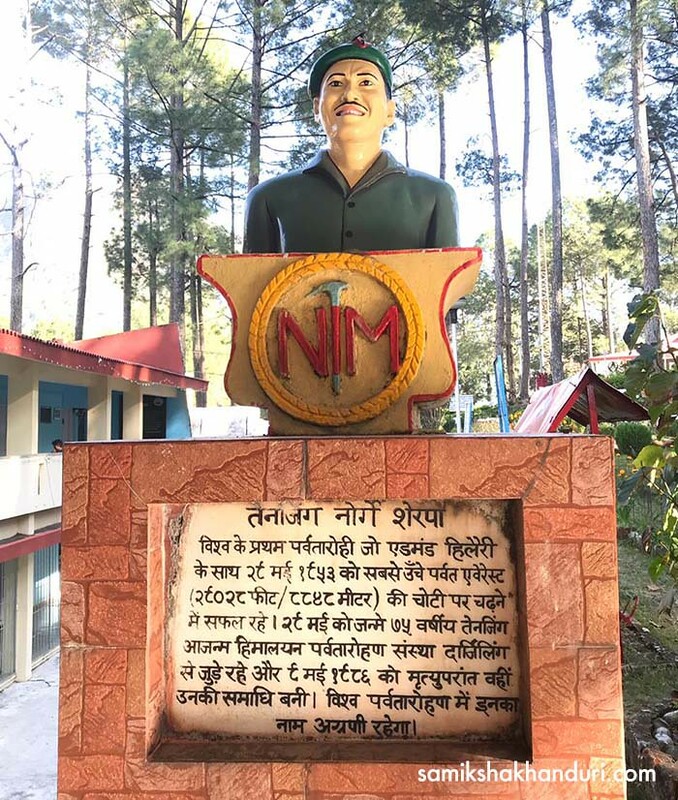 Well, to our delight we were just 2 Kms away from our abode for the next 10 days – N.I.M Base Camp – 3. There are certain steps in Meditation, which you cannot skip. In order to attain a perfect sense of meditation, one needs to undergo through all stages of Meditation. Mountaineering too is like meditation, one does not become a mountaineer overnight. Neither can one skip the steps of mountaineering & living in a mountain. So our actual training began with load ferry to the base Camp. Today each rope had to gather certain kgs of Ration & stock it in our rucksacks. The rucksacks felt nothing like yesterday, as by now our body & mind were harmonised to hardships. This 2 Km trek from Gujjar Hut to Base Camp @ 12, 800 ft felt nothing close to what we went through the day before. It was a peaceful uphill hike, amidst the dry fields of sunlight & a closer view of the Glacier from our Base Camp. 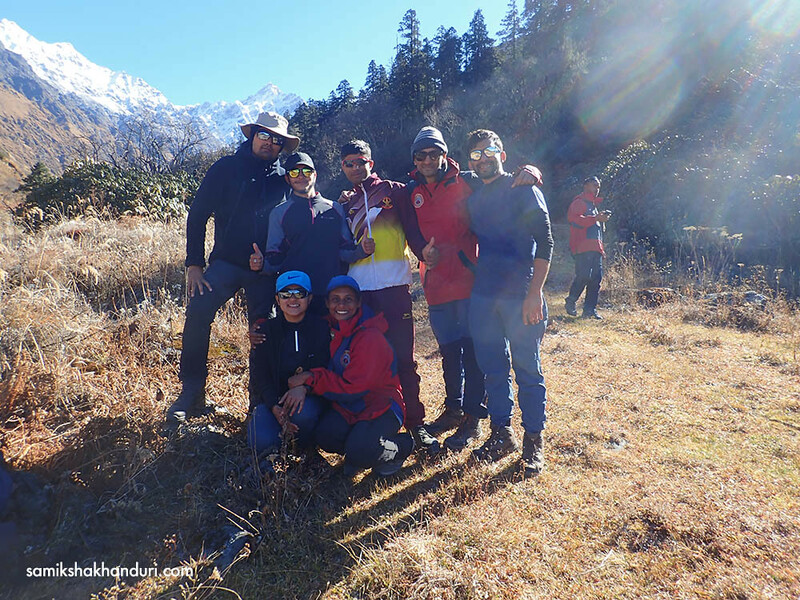 While we offloaded our Rations & essentials at the base camp, the instructors were liberal enough to let us stretch our backs on the grass & simply absorb the views. This was not going to be the same for the day’s to come. So we had our quick time in the sun & started our journey back to the Gujjar Hut for the night. Our instructors leading us in packs, showing around the beauty of this place, was immensely satisfying. For a moment I almost felt like Hiedi running down the Swiss Alps with Peter making way ahead. On reaching the Gujjar Hut camp we had a hearty meal & ganged up with our girls! Today we got another day of good time to catch up on rest, reading & writing. Or simply bask in the sun. Towards late afternoon, we were given an introduction to the Gujjar Hut area. The trees, the mountain massifs we were surrounded by & soon we were taken for a hike to Kheda Tal, a high altitude lake at 11,000 ft. The lake premises had a spooky vibe to it, more so when we felt our foot movements on a marshy ground. The land was almost bouncing there. On our way back one could just not miss the spellbinding vast expanse of fields, adorned by the mountain massifs. We marched back to our tents & layered ourselves up for soup & dinner. Perched on my glove near the fire, I gasped for a breath to be able to eat a quick meal. I was yet again, a little restless about the days to come. Mountains can make you really lonely sometimes. As for me they have very ambiguous associations – strength & crisis both. Here the baggage that we try to do away with comes in a different form – in the shape of a void. While everyone was heading to catch up on sleep, I was catching up on memories like a projector flashing Images, with no ending. People from home, family, friends, everyone came rushing into the mind. I engaged myself in a sickening laughter to distant the homesick thoughts. One man I could not get off my mind was my father, without whom I could not even think of enrolling for this course. I wanted to be here, to step into his shoes, to see all the great wonders of the world which became a part of his essence. The mountains, precisely. And there I was coaxing myself to move ahead, just at the thought of seeing him after successfully completing the course. Once sleep gets you on a cold winter night, there are just no thoughts left. You sleep only hoping to wake up tomorrow. Base Camp 3 at 12,800 ft. Photo Credit: Sreenivasa Sudheendra. The next morning felt like, there was no way out of the sleeping bag, struggling to oblige our instructors by reporting with our rucksacks on time. We now headed for a journey into greater wilderness of the Base Camp – 3. Walking uphill for 3 kms today, was still a leisure walk, in comparison to what was to come in the next 7 days! We wrapped ourselves under the starry night of our first day at the Base Camp to realise now we had 7 days of Ice & Snow Craft to learn & practice. Dinner was served under an open sky roof & the white reflection of the glacier at a distance was enough to lull me to sleep that night. Note to Readers – Why I call this article as being in the Middle of the Mountain, would be unravelled in the next article. Stay tuned.